The urge to identify as meaningful the patterns we see in winning streaks in sports, or streaks of successes in business, can lead us to accept bogus explanations prematurely. It's a common human tendency that can put people and organizations in desperate situations. 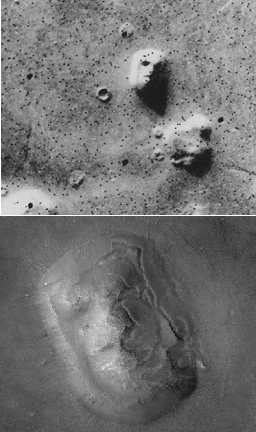 The "Face on Mars" as seen by Viking 1 in 1976 (top), compared to the Mars Global Surveyor image taken in 2001 (bottom). When the image was first released, it set off a flurry of speculation among those unaware of the dangers of apophenia or its cousin, pareidolia. The idea of a face carved on Mars by aliens took root, and even led to the release of a film, Mission to Mars, starring Tim Robbins, Gary Sinise, and Don Cheadle. To this day, the phrase face on Mars gets over 548 million hits at Google, which is most respectable for a thoroughly debunked illusion. Photos courtesy U.S. National Aeronautics and Space Administration, Viking mission and Mars Global Surveyor mission. Apophenia is the experience of perceiving meaningful patterns in data that do not actually manifest those patterns. Klaus Conrad, a German neurologist and psychiatrist, introduced the term in the 1950s, and although its meaning has evolved somewhat since then, there's little doubt that it describes a real human experience. For example, people tend to believe that craps players who make several "passes" (winning throws) are "hot." They believe that there is a causal connection between recent past throws and the outcome of the next throw. In fact, if the game is honest, there are no meaningful patterns at all, at least none that have any causal relation to the outcome of the next throw. Each throw is random and independent of all others. Apophenia is related to — or similar to or identical to — a rather numerous collection of behavioral phenomena, including conspiracy theories, the clustering illusion, pareidolia, and the whimsically named but quite serious Texas Sharpshooter Fallacy. I'll let you explore this territory on your own (see links below). For now, let's take a look at some of the manifestations of apophenia and its cousins in the workplace. Sometimes leaders or visionaries acquire reputations within their organizations based on past performance. A belief takes hold: "She was so brilliant on Marigold that she must have the magic touch." But in most organizations, success is organizational — many people and processes contribute. Celebrity leaders or visionaries might have made significant contributions, but many others did too, and chance almost certainly played a role. Just as some become mythically heroic, others become outcasts or pariahs, based on perceived patterns that are actually irrelevant. Many a career has been destroyed by those who attribute meaning to supposed patterns beyond what the evidence actually justifies. Some wily managers — or in professional sports, wily coaches — have built successful organizations by prowling the marketplace for good people erroneously tagged as inept or untalented. irrelevantin workplace politics, we must necessarily interpret information that's inherently ambiguous. Interpreting as malicious and personally motivated the actions of someone you don't know well might be incorrect. Not everything such people do is aimed at you. Some believe that locating a facility in a fashionable district is important to business success. They point to geographical clustering of their competitors as justification for their belief. For some businesses, a particular address can be important. But is it truly necessary for your business? Projects never go quite as planned. We expect that, but we don't expect disaster. How can we get better at spotting disaster when there's still time to prevent it? How to Spot a Troubled Project Before the Trouble Starts is filled with tips for executives, senior managers, managers of project managers, and sponsors of projects in project-oriented organizations. It helps readers learn the subtle cues that indicate that a project is at risk for wreckage in time to do something about it. It's an ebook, but it's about 15% larger than "Who Moved My Cheese?" Just USD 19.95. Order Now! . Pareidolia is the psychological phenomenon typified by seeing images of animals or faces in clouds, or hearing hidden messages in audio recordings played in reverse. The clustering illusion is the tendency to perceive erroneously that small samples from random distributions have significant "streaks" or "clusters." The Texas sharpshooter fallacy is a logical fallacy in which an assertion about the existence of a pattern is based on similarities among pieces of information that have no relationship to one another, ignoring any contradictory data. For more about apophenia, see "Wishful Thinking and Perception: I," Point Lookout for October 28, 2015, and "Cognitive Biases and Influence: II," Point Lookout for July 13, 2016. Would you like to see your comments posted here? rbrenhqigAmCdWTeyFRnTner@ChacdDMDUtAwLzarEDLhoCanyon.comSend me your comments by email, or by Web form. Some of what we "know" about managing projects just isn't so. Identifying the fallacies of project management reduces risk and enhances your ability to complete projects successfully. We necessarily make assumptions about our lives, including our work, because assumptions simplify things. And usually, our assumptions are valid. But not always. When complex systems misbehave, a common urge is to find any way at all to end the misbehavior. Succumbing to that urge can be a big mistake. Here's why we succumb. When manipulators try to manipulate others, they're attempting to unscrupulously influence their targets to decide or act in some way the manipulators prefer. But some targets manage to outwit their manipulators. See also Critical Thinking at Work and Rhetorical Fallacies for more related articles. I offer email and telephone coaching at both corporate and individual rates. Contact Rick for details at rbrenqwNLDiEKjNqtqwYjner@ChacWJNSxdRzOlJkxVzxoCanyon.com or (650) 787-6475, or toll-free in the continental US at (866) 378-5470.